Make sure you have the tools to finally capture the image you have been dreaming of with the programmable Pluto Trigger, which is made available here as a B&H Kit that includes a Shutter Release Cable for Nikon DC2 Cameras. Able to be connected to a smartphone app, users will have excellent control over various intervalometer and triggering modes as well as the ability to set up sensors for more elaborate photography setups. Take the guesswork out of triggering a camera with the features of the Pluto Trigger. It has the ability to function as either a simple infrared remote or it can connect to a smartphone over Bluetooth 4.0 LE for programming and setup of advanced modes. This provides users with a plethora of options and sensors to help them record time lapses, fast-moving subjects, and much more. The Pluto Trigger features multiple built-in sensors, including light, sound, and infrared, as well as an aux port for attaching other sensors. This can dramatically speed up response times to certain subjects, allowing the capture of balloons popping, lightning strikes, and more. This is augmented by the various intervalometer settings for creating specific shooting settings for your scene and the ability to use the sensors of your phone to access other, more unique triggering modes. 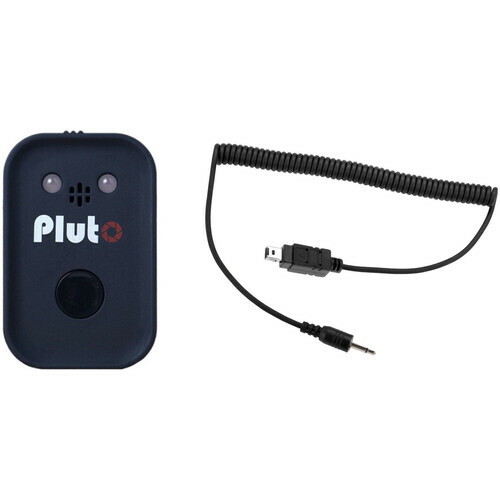 The Pluto Trigger features a standard 2.5mm camera connection that allows users to pick up different cables to work with their cameras. Also, this port can be used to connect a flash with the included PC sync cord. Alongside these ports is a micro-USB connection, which is how users can charge the built-in rechargeable lithium-ion battery, which can run for about 20 hours with normal usage. Can trigger a camera via an infrared remote and the physical shutter release button or by using an optional connection cable. Connects to smart devices using the iOS/Android mobile app via Bluetooth 4.0 Low Energy with a range of about 66'. Status LED will alert you to the current settings, battery life, and connectivity strength. Built-in rechargeable lithium-ion battery offers a normal life of about 20 hours or 40 hours when Bluetooth is turned off. Offers a 2.5mm aux input for using optional sensors. The 2.5mm camera output can also be used to connect a flash via the included PC sync cable. Shutter Release: For simple triggering of your camera, this mode offers a variety of options on how to trigger your camera. This includes single shot, focus (press to focus, release to take a photo), hold (press to open shutter, release to end exposure), lock (press to open shutter, press again to close shutter), bulb, burst, and timed. Time-Lapse: Set the Pluto Trigger to take a set number of photos with a preset time interval and an optional start delay. It can use either your camera settings or perform bulb-ramping for more advanced time lapses. HDR: Shoot up to 19 photos for an HDR sequence with exposure step values between 1/3 to 3 stops. Star Trail: Create long exposures of the night sky for clear images with star trails. Video: Use the Pluto Trigger to automatically start recording again once you hit your camera's recording time limit. Timer: Set the trigger to take photos or record video at a specific time each day for long-term projects. Laser: Using the included laser pointer in combination with the trigger's light sensor, users will be able to create a setting that will trigger the camera when the laser beam is broken. This has a response time of tens of microseconds. Sound: Trigger your camera upon hearing a sound, such as popping a balloon or breaking glass. This mode allows users to set sensitivity and delay for achieving the appropriate response time. Light: Triggers the camera when the light sensor notices an increase or decrease in ambient light. Lightning: Quickly triggers the camera when it senses a bright flash of light. Infrared: Triggers the camera when there is a change in infrared emissions, such as from a passing animal or person. Droplet: When the trigger is connected to the optional Valve Kit users can easily capture water droplets through a pre-programmed method. Aux: Users can attach various sensors to the trigger's 2.5mm aux port to trigger the camera with various other methods. Fusion: Combine various sensors together to create a more specialized setting for your specific shoot. Sound: Users can use the microphone in their smartphone to trigger a camera when a sound is heard. Vibrate: Using the accelerometer of your phone, this mode will trigger the camera when vibration hits a pre-determined threshold. Motion: By using the camera of your smartphone users can create a setup that will trigger the camera when motion is detected in front of your smartphone's camera. Distance: This mode will capture photos as you travel over distance using your smartphone's GPS. This prevents unnecessary photos from being captured when you stop. Voice: Users can use the voice command "Pluto" regardless of ambient noise levels to trigger the camera remotely. Smile: Take selfies easily by using the camera of your smartphone to tell the trigger when you are smiling. Depth of Field: This calculator will determine the hyperfocal distance based on the lens focal length, aperture, and camera type. Sun Position: Provides official and civil sunrise and sunset times based on your current location and local time. Two countdown clocks are available to shoe upcoming events. ND Filter Calculator: Calculate the correct exposure time when using neutral density filters. It uses the filter strength and current shutter speed to provide an accurate shutter speed. Starscape Rule: By selecting your camera model and actual focal length this tool will calculate the slowest shutter speed possible for sharp, pinpoint stars. Users can select Rule of 500 or Rule of 400 based on the speed of stars in their location. Box Dimensions (LxWxH) 6.4 x 4.1 x 2.7"
Trigger with Shutter Release Cable Kit for Nikon DC2 Cameras is rated 4.7 out of 5 by 3. Rated 5 out of 5 by Lochi from I would buy this product again for sure I bought this product mostly as a lightening trigger and only owned it for a few weeks. However I am still waiting for a good lightening storm to test that feature. I have used the startrails feature which produced excellent results. The Pluto Trigger has a lot of features and capability and works great with the iPhone. I have not tested it with Android. One of the reasons I chose this product over others is the fact that it could be controlled with your phone and potentially stay more current with software updates as opposed to a physical remote control that would be limited to its current capability. You need to remember to order the right shutter release cable that fits your camera, it's not included with the trigger. Looking forward to trying out many of it's other features in the near future. Rated 5 out of 5 by Bill from Well worth having this accessory. It worked the first time which was the day before I needed it. Simple connection, download, and setup. Was able to shoot a group from a distance of 50 feet without trouble. No need to modify D7200 camera settings as with the Nikon remote. Only difficulty was remembering to look at the camera before tapping the button. Rated 4 out of 5 by Michel from It does what it is advertised to do. It is easy to use. The battery duration seems to be OK. Works fine for me. ... With Nikon cameras, some features do not work ... and it should not be a surprise.